Today, we live in an age that depends upon technology, and no industry is immune. From business to healthcare to transportation, even the most long-standing industries are becoming more efficient and effective with the addition of technological advancements. For nonprofits, this is becoming increasingly apparent with the rise of nonprofit fundraising and mobile bidding software. While some platforms have been around in multiple forms for a while, new advancements in security, communication, and engagement have made it easier and more affordable than ever for nonprofits to integrate technology to increase fundraising and optimize charitable outreach. Things can get confusing, however, when nonprofit teams attempt to connect the available capabilities of fundraising solutions, including mobile bidding and online capabilities with the overall strategic goals of their organization. If a nonprofit team, for example, wants to increase attendance of a certain donor profile at an upcoming event, how do they know which capability or feature to look for in a fundraising software option? With so many different options and solutions on the market today, nonprofit teams must be able to evaluate fundraising platforms effectively — without any noise or distractions. Understanding the features of fundraising software and mobile bidding also makes it easier to understand which platform will help nonprofits best measure ROI. While nonprofit ROI may seem like an oxymoron, organizations that select a robust platform can easily track and measure a return in multiple ways — not just by measuring donations. If a team is able to host more events a year because of streamlined team processes, for example, that’s a measurable ROI. Similarly, if a donor shares a social update with his network and it results in five new attendees to an event, that’s also measurable ROI. Knowing how and where to find these areas of return is key when evaluating a new nonprofit fundraising solution — and it’s important to make sure that the platform easily provides those reporting capabilities. 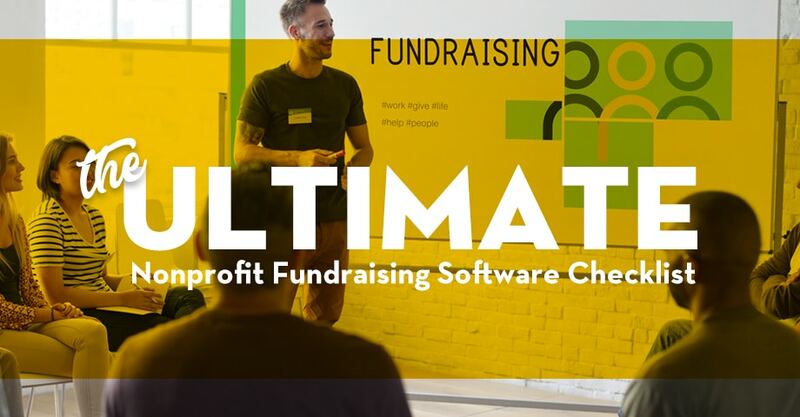 To help you get the most out of your nonprofit software purchase, we’ve compiled the ultimate checklist for nonprofit teams in the market for a new fundraising platform. Mobile bidding: enable donors, event guests, and other contacts to bid on auctions from anywhere and at any time. Online Fundraising: leverage online fundraising micro sites to help with ticketing, sponsorships, guest registration, pre-bidding, event promotion, online donations, etc. – available for your event and additional year-round fundraising. Event management: handle pre, during, and post event to dos – from registration and checkout to auction promo and donor tracking – from a single, cloud-based platform. Detailed reports: leverage detailed reports and insights to see what’s working and what areas of your fundraising need more attention, and access any report year-round. Payment processing: efficiently process donations and bids for any credit card type in a secure location with fast receipts and CRM integration. Auction management: manage online, mobile, silent, and live auctions all from a single location. Real-time support: engage with solution support specialists when and where you need it, whether it’s over the phone or in-person at your fundraising event. Recurring donations: make it easy for long-time donors to keep up with recurring donations by automating payments and receipts. Social media functionality: take advantage of the reach and power of social media by making it easy for donors to share your cause, broadcast your fundraiser, and increase donations with peers and networks. Measurable ROI: monitor platform ROI (yes, it is possible!) by tracking increased donations as well as increased team efficiency and operational optimization. Cloud-based platform: make it easy for team members to execute winning fundraisers throughout the year without any blackouts or roadblocks. Automatic upgrades: look for a platform that is continuously improving and updating with nonprofit needs. Nonprofits are constantly changing, and their technology should, too.